Office Space - Burntwood, Staffordshire. This work centre offers newly refurbished office space, which are of a high standard, spacious and modern. The work space is made up of 3070 Sq Ft and is spread over two floors. The building has many great facilities, such as kitchen units on each floor, 24 hour access, nine on-site car parking spaces and air conditioning. 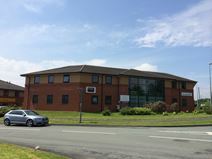 The business centre is centrally located between Lichfield and Cannock and is in easy reach of the M6 Toll, junction T6 is just two miles away.